1 / The gasoline from the fuel enters at ambient temperature liquid. 2 / As its temperature is raised, it begins to vapourize. 3 / At 450°, it’s completely vapourized and ready for cracking. It has little or no air to burn. 4 / Steam is added. The catalyst “cracks” (converts) the vapour into methanol and natural gas. – The Diesel Condensator unit solves a major engine blow-by problem by trapping the unrefined oil in the container. This will reduce maintenance costs,air pollution and road oil pollution. The unit costs $400.00 US — plus installation. – The Condensator is a device that uses catalytic reaction to break down engine oil vapours, that normally foul an engine, into useable fuel. It will only increase mileage by up to 27%; but it will decrease pollution by up to 75%. gasoline version is $90.00 US for injection or carburetor. – The Grose Jet is a replacement valve for inside the carburetor. It will keep the fuel properly regulated and prevent flooding. The gains vary depending on how bad the mileage was. $9.00 -$12.00 each – order direct 781 438-1773 . HIMAC is a research-based publishing company situated in Niagara Falls, Ontario. started by J. Bruce McBurney, HIMAC has established a mandate to raise public awareness on an important scientific finding that has been suppressed by hypocritical governments and greedy oil companies and automobile manufacturers: the supression of a super-high mileage fuel conversion carburetor system. Since 1996, the website www.himacresearch.com has become an exposure and contact point for many. Many more inventors and researchers have surfaced than ever before, making an overwhelming body of evidence that the claims are chemically and mechanically possible. Our Latest publication is to much for a book it is on a CD/ROM “The APOD Fuel system” By Anthony P. O’ Donnell from Australia. This is a CD jammed packed with his development of a device to triple your fuel mileage it comes with interactive Auto cad 2000 drawings and complete collection of notes testimonials pictures and text to help you build your own system. Also he has an article from 1927 with an fellow Australian inventor getting 85 -92 M.P.G. with a 1926 Chrysler over 400 pages as well as 140 auto cad drawings $39.95 see books section button upper left hand corner. follow the list of 569 patent number for US Patents in class123, subclass 545- ‘ internal combustion engine carburetors that use heat to vaporize gasoline’ , given from the years 1997 to 1900. Put the Fuel Atomizer 2000 on your car or truck and enjoy at least some, if not all,of The Big 5 Functions of this fine product. Increases Gas Mileage, Increases the Power of the Engine, Increases the Engine’s Performance, Decreases Engine Wear and Tear, Decreases Tail Pipe Pollution. A product that has been on the market since 1991, and since then people have responded to the Fuel Atomizer 2000 in all 50 states and Canada, plus South Africa, France, New Zealand, Taiwan, Italy, Singapore, Norway, Australia, Israel, Germany, and many more. Why This Product Works: Let us give you the inside information as to why this product works: Few people realize that gasoline engines can only run when the fuel is atomized (vaporized) because liquid gasoline will flood the engine. Your present vehicle can only atomize 10 to 20% of each gallon of fuel. The Fuel Atomizer 2000 can, in most cases, double the atomizing process thereby giving you a substantial increase in mileage. That Is Just Half Of The Story!Because the burning of fuel is more efficient, an engine will run cleaner and release fewer emissions into the atmosphere. One member’s vehicle with over 100,000 miles failed the emissions test. Four weeks after installing the Fuel Atomizer 2000, the vehicle was retested and the examiner was astonished that the results showed less harmful emissions than a brand new engine. 1:We want our children and grandchildren to have clean air to breath. 2:We want to spread the FIVS technology and the FIVS throughout the world. 3:With a FIVS installed in your car when you gas up you no longer support your local Terrorists. 4:With the FIVS installed on the majority of vehicles in the United States,we will not need a drop of the Persian Gulf Oil. They will not have the money to terrorize the United states. 5: The Oil companies willno longer hold America hostage with their price gouging, instead they will have oil up their ying yang. Attention before you enter my website I want you to know that my life work is in the FIVS. I have given away absolutely 100% free the Cad drawings and blueprints to the FIVS Gen I, the FIVS Gen II, the FIVS Gen III, and the FIVS Gen III A. I have given all I am going to give. Everybody just takes from me and few give. I have the FIVS Gen IV for gasoline fuel injected engines and the FIVS Gen V which is for diesel engines. We are installing the FIVS Gen IV in an Olds Cutlass and the FIVS Gen V in an 18- wheeler. What I am saying is that the FIVS Gen IV and FIVS Gen V ARE NOT FREE. I have given enough of my life away andI am now 61, disabled and can’t collect disability nor one cent, when I reach 65 I can’t even collect Social security. If you have an extra dollar or two donations are gratefully accepted. Many of thousands of people have download my Cad drawings, called me, and kept me on the phone for hours on end. Some would call me on my cell phone and use up my minutes. Only two people have given a little money to help, one paid for the 7 year patent fee. I don’t have the money at this time because I am just about broke. The Fish Carburetor was originally invented by John Robert Fish in America in the early Thirties. He was possibly the originator of the “Iron Lung” as he invented a “pressure bag” for his wife who appeared to suffer with serious circulation problems. The raising and lowering of the bag pressure apparently helped her greatly. Carburetion Principles : When he came to look at carburetors initially, it was to stop the waste of fuel as it slopped about on cornering, braking and hard acceleration. All standard or conventional carburetors are entirely dependant on a stable fuel level to feed through the “Manometer” principle. He demonstrated the point by fitting a glass jug to the bonnet (hood) of a car. The level changed by literally inches on hard cornering. – Fuel level was not critical to metering under any conditions. – No Venturi was required to potentially strangle the air flow. – A single progressive metering groove did away with both main and corrector jets, as well the Venturi. – The carb works on pressure differential – not air speed, which means that it is almost instantly self adjusting & self compensating so any change in weather or altitude requires no adjustments or modifications as with conventional carbs. 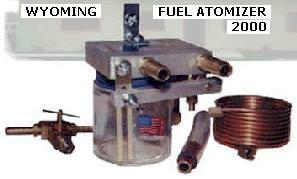 – Instead of the usual one main fuel discharge point within the carburetor, the “Fish” has from SIX to TEN leading to vastly superior atomization and therefore much improved vaporization and since wet fuel DOES NOT burn (only the vapor), better and more complete combustion is ensured enabling more power to be extracted from the same amount of fuel. Result – again LESS WASTE! The Struggle : The “Fish” was seen as a very serious threat to the “Original Equipment” establishment and could not be tolerated. J.R. suffered years of dirty tricks and persecution in an attempt to put him and his carburetor out of business. He even had his mail stopped on trumped up charges which were entirely UNTRUE and the case never went to court. It was simply a deliberate time wasting exercise to stop his cash flow and ruin him. This invention relates to a device for obtaining an intimate contact between a liquid in a truly vaporous state and a gas, and particularly to such a device which may serve as a carburettor for internal combustion engines and is an improvement on the form of device shown in my USP 1,938,497, of 1933. In carburettors commonly used for supplying a combustible mixture of air and liquid fuel to internal combustion engines, a relatively large amount of the atomised liquid fuel is not vaporised and enters the engine cylinder more or less in the form of microscopic droplets. When such a charge is ignited in the engine cylinder, only that portion of the liquid fuel which has been converted into the vaporous, and consequently molecular state, combines with the air to give an explosive mixture. The remaining portion of the liquid fuel which is drawn into the engine cylinders remains in the form of small droplets and does not explode imparting power to the engine, but instead burns with a flame and raises the engine temperature above that at which the engine operates most efficiently, i.e. from 160 to 180 F.
In my earlier patent, there is shown and described a form of carburettor in which the liquid fuel is substantially completely vaporised prior to its introduction into the engine cylinders, and in which, means are provided for maintaining a reverse supply of ‘dry’ vapour available for introduction into the engine cylinder. Such a carburettor has been found superior to the standard type of carburettor referred to above, and to give a better engine performance with far less consumption of fuel. 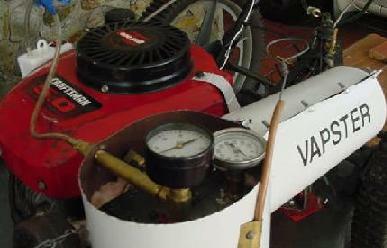 It is an object of the present invention to provide a carburettor in which the liquid fuel is broken up and prepared in advance of and independent of the suction of the engine and in which a reserve supply of dry vapoour will be maintained under pressure, ready for introduction into the engine cylinder at all times. It is also an object of the invention to provide a carburettor in which the dry vapour is heated to a sufficient extend prior to being mixed with the main supply of air which carries it into the engine cylinder, to cause it to expand so that it will be relatively lighter and will become more intimately mixed with the air, prior to explosion in the engine cylinders. 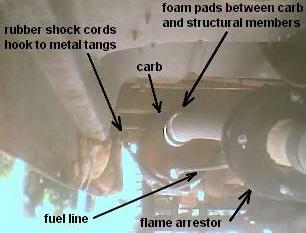 I have found that when the reserve supply of dry vapour is heated and expanded prior to being mixed with the air, a greater proportion of the potential energy of the fuel is obtained and the mixture of air and fuel vapour will explode in the engine cylinders without any apparent burning of the fuel which would result in unduly raising the operating temperature of the engine. More particularly, the present invention comprises a carburettor in which liquid fuel vapour is passed from a main vaporising chamber under at least a slight pressure, into and through a heated chamber where it is caused to expand and in which droplets of liquid fuel are either vaporised or separated from the vapour, so that the fuel finally introduced into the engine cylinders is in the true vapour phase. The chamber in which the liquid fuel vapour is heated and caused to expand, is preferably comprised of a series of passages through which the vapour and exhaust gasses from the engine pass in tortuous paths in such a manner that the exhaust gasses are brought into heat interchange relation with the vapour and give up a part of their heat to the vapour, thus causing heating and expansion of the vapour. Fig.3 is a side elevation of the carburettor. This invention relates to carburettors suitable for use with internal combustion engines and is an improvement on the carburettors shown in my USP 1,938,497, of 1933, and 1,997,497 of 1935. In my earlier patents, an intimate contact between such as the fuel used for internal combustion engines, and a gas such as air, is obtained by causing the gas to bubble up through a body of the liquid. The vaporised liquid passes into a vapour chamber which preferably is heated, and any liquid droplets are returned to the body of the liquid, with the result that the fuel introduced into the combustion chambers is free of liquid particles, and in the molecular state so that an intimate mixture with the air is obtained to give en explosive mixture from which nearer the maximum energy contained in the liquid fuel is obtained. Moreover, as there are no liquid particles introduced into the combustion chambers, there will be no burning of the fuel and consequently, the temperature of the engine will not be increased above that at which it operates most efficiently. In my USP 1,997,497, the air which is to bubble up through the body of the liquid fuel is forced into and through the fuel under pressure and the fuel vapour and air pass into a chamber where they are heated and caused to expand. The introduction of the air under pressure and the expansion of the vaporous mixture ensures a sufficient pressure being maintained in the vapour heating and expanding chamber, to cause at least a portion of it to be expelled from it into the intake manifold as soon as the valve controlling the passage to it is opened. In accordance with the present invention, improved means are provided for maintaining the vaporous mixture in the vapour-heating chamber under a predetermined pressure, and for regulating such pressure so that it will be at the optimum for the particular conditions under which the engine is to operate. Such means preferably comprises a reciprocating pump operated by a vacuum-actuated motor for forcing the vapour into and through the chamber. The pump is provided with a suitable pressure-regulating valve so that when the pressure in the vapoour-heating chamber exceeds the predetermined amount, a portion of the vapour mixture will be by-passed from the outlet side to the inlet side of the pump, and so be recirculated. Charles Nelson Pogue invented a carburetor that vaporized gasonline, instead of nebulizing it into tiny drops, thus dramatically increasing mileage per gallon of gasoline used. Like so many other inventions, that carburetor did not fit in with the business plans of those in the auto and oil industries. It was bought and shelved, leaving enthusiasts to try and make their own … if they had the specialized knowledge and tools to do so. This invention relates to fuel vaporising devices for combustion engines and more particularly, is concerned with improvements in devices of the kind where provision is made for using the exhaust gasses of the engines as a heating medium to aid in the vaporisation of the fuel. One object of the invention is to provide a device which will condition the fuel in such a manner that its potential energy may be fully utilised, thereby ensuring better engine performance and a saving in fuel consumption, and preventing the formation of carbon deposits in the cylinders of the engine and the production of carbon monoxide and other objectionable gasses. A further object is to provide a device which is so designed that the fuel is delivered to the cylinders of the engine in a highly vaporised, dry and expanded state, this object contemplating a device which is available as an exhaust box in which the vaporization and expansion of the liquid components is effected at sub-atmospheric pressures and prior to their being mixed with the air component. A still further object is to provide a device which will condition the components of the fuel in such a manner that they be uniformly and intimately mixed without the use of a carburetor. A still further object is to provide a device which will enable the use of various inferior and inexpensive grades of fuel. Fig. 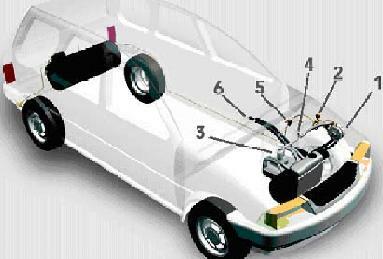 1 is an elevational view of the device as applied to the engine of a motor vehicle. Fig. 2 is an enlarged view of the device, partially in elevation and partially in section. Fig. 3 is a section taken along line 3–3 of Fig. 2. Fig. 4 is a section taken along line 4–4 of Fig. 3. Fig. 6 is a section taken along line 6–6 of Fig. 4. The device as illustrated, includes similar casings 8 and 9 which are secured together as a unit and which are formed to provide vaporising chambers 10 and 11, respectively, it being understood that the number of casings may be varied. Two series of ribs 12 are formed in each of the vaporising chambers, the ribs of each series being spaced from one another so as to provide branch passages 13 and being spaced from the ribs of the adjacent series to provide main passages 14 with which the branch passages communicate. The vaporising chambers are closed by cover plates 15. The cover plates carry baffles 16 which are supported in the spaces between the ribs 12. The baffles extend across the main passages 14 and into, but short of the ends of the branch passages 13 to provide tortuous paths. Outlet 10a of chamber 10 is connected by conduit 17 to inlet 11a of chamber 11. Outlet 18 of chamber 11, is connected by conduit 19 with mixing chamber 20 which is located at the lower and of pipe 21 which in turn is connected to and extension 22 of the intake manifold 22a of the engine. Extension 22 contains a valve 23 which is connected by a lever 23a (Fig. 1) and rod 23b to a conventional throttle (not shown). The liquid fuel is introduced into the vaporising chamber 10 through nozzle 24 which is connected by pipe 25 to a reservoir 26 in which the fuel level is maintained by float-controlled valve 27, the fuel being supplied to the reservoir through pipe 28. In accordance with the invention, ribs 12 are hollow, each being formed to provide a cell 29. The cells in one series of ribs open at one side into an inlet chamber 30, while the cells of the companion series open at one side into an outlet chamber 31. The cells of both series of ribs open at their backs into a connecting chamber 32 which is located behind the ribs and which is closed by a cover plate 33. Casings 8 and 9 are arranged end-to-end so that the outlet chamber of 9 communicates with the inlet chamber of 8, the gasses from the exhaust manifold 34 being introduced into the inlet chamber of casing 9 through extension 34a. The exhaust gasses enter the series of cells at the right hand side of the casing, pass through the cells into the connecting chamber at the rear and then enter the inlet chamber of casing 8. They pass successively through the two series of cells and enter exhaust pipe 35. The exhaust gasses leave the outlet chamber 31, and the path along which they travel is clearly shown by the arrows in Fig. 6. As the gasses pass through casings 8 and 9, their speed is reduced to such a degree that an exhaust box (muffler) or other silencing device is rendered unnecessary. It will be apparent that when the engine is operating a normal temperature, the liquid fuel introduced into chamber 10 will be vaporised immediately by contact with the hot walls of ribs 12. The vapour thus produced is divided into two streams, one of which is caused to enter each of the branch passages at one side of the casing and the other is caused to enter each of the branch passages at the opposite side of the casing. The two streams of vapour merge as they pass around the final baffle and enter conduit 17, but are again divided and heated in a similar manner as they flow through casing 9. Each of the vapour streams is constantly in contact with the highly heated walls of ribs 12. This passage of the vapour through the casings causes the vapour to be heated to such a degree that a dry highly-vaporised gas is produced. In this connection, it will be noted that the vaporising chambers are maintained under a vacuum and that vaporisation is effected in the absence of air. Conversion of the liquid into highly expanded vapour is thus ensured. The flow of the exhaust gasses through casings 8 and 9 is in the opposite direction to the flow of the vapour. The vapour is heated in stages and is introduced into chamber 20 at its highest temperature. The air which is mixed with the fuel vapour, enters pipe 21 after passing through a conventional filter 36, the amount of air being regulated by valve 37. The invention also contemplates the heating of the air prior to its entry into mixing chamber 20. To this end, a jacket 39 is formed aroundpipe 21. The jacket has a chamber 40 which communicates with chamber 32 of casing 9 through inlet pipe 41 and with the corresponding chamber of casing 8 through outlet pipe 42. A portion of the exhaust gasses is thus caused to pass through chamber 40 to heat the air as it passes through conduit 21 on its way to the mixing chamber. Valve 37 is connected to valve 23 by arms 43 and 43a and link 44 so that the volume of air admited to the mixing chamber is increased proportionately as the volume of vapour is increased. As the fuel vapour and air are bith heated to a high temperature and are in a highly expanded state when they enter the mixing chamber, they readily unite to provide a uniform mixture, the use of a carburettor or similar device for this purpose being unnecessary. From the foregoing it will be apparent that the components of the fuel mixture are separately heated prior to their ebtry into mixing chamber 20. As the vapour which is produced is dry (containing no droplets of liquid fuel) and highly expanded, complete combustion is ensured. The potential energy represented by the vapour may thus be fully utilised, thereby ensuring better engine performance and a saving in fuel consumption. At the same time, the formation of carbon deposits in the combustion chambers and the production of carbon monoxide and other objectable exhaust gasses is prevented. The device has the further advantage that, owing to the high temperature to which the fuel is heated prior to its admisssion into the combustion chambers, various inferior and inexpensive grades of fuel may be used with satisfactory results. A fuel economy system for an internal combustion engine which, when installed in a motor vehicle, obviates the need for a conventional carburetor, fuel pump and gasoline tank. The system operates by using the engine vacuum to draw fuel vapors from a vapor tank through a vapor conduit to a vapor equalizer which is positioned directly over the intake manifold of the engine. The vapor tank is constructed of heavy duty steel or the like to withstand the large vacuum pressure and includes an air inlet valve coupled for control to the accelerator pedal. The vapor equalizer ensures distribution of the correct mixture of air and vapor to the cylinders of the engine for combustion, and also includes its own air inlet valve coupled for control to the accelerator pedal. The system utilizes vapor-retarding filters in the vapor conduit, vapor tank and vapor equalizer to deliver the correct vapor/air mixture for proper operation. 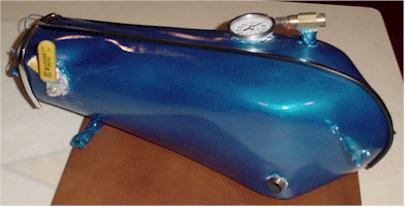 The vapor tank and fuel contained therein are heated by running the engine coolant through a conduit within the tank. Due to the extremely lean fuel mixtures used by the present invention, gas mileage in excess of one hundred miles per gallon may be achieved. The Chapin US Pat. No. 1,530,882 discloses a gasoline tank surrounded by a water jacket, the latter of which is included in a circulation system with the radiator of the automobile. The heated water in the circulation system causes the fuel in the gasoline tank to readily vaporize. Suction from the inlet manifold causes air to be drawn into the tank to bubble air through the gasoline to help form the desired vapor which is then drawn to the manifold for combustion. The Buckton et al US Pat. No. 3,759,234 advances a fuel system which provides supplementary vapors for an internal combustion engine by means of a canister that contains a bed of charcoal granules. The Wentworth and Hietrich et al U.S. Pat. Nos. 3,221,724 and 3,001,519 also teach vapor recovery systems which utilize filters of charcoal granules or the like. The Dwyre US Pat. No. 3,713,429 uses, in addition to the normal fuel tank and carburetor, an auxiliary tank having a chamber at the bottom thereof which is designed to receive coolant from the engine cooling system for producing gasoline vapors. The Walker U.S. Pat. No. 3,395,681 discloses a fuel evaporator system which includes a gasoline tank intended to replace the normal gasoline tank, and which includes a fresh air conduit 22 for drawing air into the tank. while the Crabtree et al U.S. Pat. No. 2,312,151 teaches a vaporization system which includes a gas and air inlet port located in a vaporizing chamber and which includes a set of baffles for effecting a mixture of the air and vapor within the tank. while Sommerville U.S. Pat. No. 4,015,570 teaches a liquid-fuel vaporizer which is intended to replace the conventional fuel pump and carburetor that is designed to mechanically change liquid gasoline to a vapor state. On May 1, 1977, the El Paso Times carried a banner headline that stated, “200 Miles On Two Gallons Of Gas.” A local inventor had come up with a device that was a substitute for the carburetor of an automobile and the device would get incredible gas mileages. Not only did the device save money on gas, but the emissions that came out of the vehicle tested were so clean that the inventor claimed you could “dry your hair” with the exhaust! Thomas Hans Werner Peter Wolfgang Dinglestadt Ogle, an youthful inventor of German descent, had noticed one day that when he punctured a hole in a lawn mower gas tank, the mower kept running off of the gasoline vapors for quite a while after he connected a line from the tank directly to the carburetor. Ogle theorized that he could use this principle to create a device that, instead of preparing a fuel/air mixture for the engine to burn, would make it so that the engine burned the gasoline vapors. Ogle created such a device and mounted it inside of a 1970 Ford Galaxie. The inventor notified the press that he was going to travel from El Paso, Texas to Deming, New Mexico on no more than two gallons of gas; this was a trip of over 200 miles! Reporters inspected the car for hidden tanks or hoses, and none were found. Prior to going public with his device, Ogle had previously gone taken a trip of about 280 miles in a similarly-equipped 1972 Thunderbird, also with only two miles of gas. Ogle went on to fit several other cars with his device. After the media reported the seemingly astonishing feat, skeptics stepped out of the woodwork to denounce the apparent impossibility of the feat. Physics professors indicated that it was impossible to use the fuel that efficiently and that the claims must have been exaggerated. Engineers stated that there must have been hidden fuel sources, and that the trip was a hoax. Ogle allowed at least two different inspections of his car and the device he installed. Registered state engineer Frank Haynes Jr. conducted one inspection, and another inspection was conducted by Professor John Whitacre and Professor Garry Hawkins from the Mechanical Engineering department at the University of Texas at El Paso. Both inspections indicated that the device did what Ogle represented that it did; that is, that the device allowed the old car that Ogle used in his run to Deming to get in excess of 100 miles per gallon. At this point, Ogle was on top of the world. As the inventor of an energy-saving device that cleaned up emissions to the point that there was almost nothing but a small amount of water coming out of the tailpipe, it seemed that the device he made would revolutionize the automobile industry. At the time, the country was in the midst of the “energy crisis”, or the political decision by President Jimmy Carter to attempt to conserve finitefossil fuel resources to try to avoid an unforeseen disaster in the future due to a shortfall. However, the device never came to be. At this point in time, there does not exist a single mass-produced vehicle that carries the device Ogle invented. What happened in the meantime? Ogle invited U.S. Congressman Richard White to view the operation of the device along with an official from the National Energy Research and Development Administration, who expressed enthusiastic interest in the invention. However, word began to circulate that there were previous patents for similar devices. Of course, this would not have been an insurmountable obstacle, since if someone had stepped forth with a claim on a patent for a previous device, Ogle could have entered into negotiations to pay a royalty to the holder of the previous patent. Rumors swirled around indicating that General Motors had patented such a device several years earlier; however, there was no public evidence that anyone had made any claim to hold a competing patent. The bright future that Ogle foresaw quickly began evaporating. Perhaps no one will ever truly know what happened that led to the further troubles that the inventor experienced after this point, but some facts are known. Ogle and a partner named James Peck, who had assisted Ogle with financing the development of his device, ran into some minor difficulties in working out a contractual agreement as to the distribution of royalties. The two had a falling-out, but Ogle continued marketing the device. In the meantime, Frank Read, another inventor who had come up with a similar device that didn’t get near the gas mileage that Ogle had gotten and whose device did not completely bypass the carburetor, went public with the news that he had been hit with several lawsuits, including one from the Texas Attorney General’s office for consumer fraud. Around this same time, the official from the NERDA who had previously viewed the device with Congressman White began indicating that he did not think development of the device would be feasible. The official had previously indicated some enthusiasm for the device, and the turn-around in his attitude was fairly mysterious. Ogle became involved in several lawsuits that drained his time and energy. The young inventor’s newly opened business began failing. More trouble from the government began descending on Ogle. The Securities and Exchange Commission served a firm with which Ogle had contracted for marketing rights with an injunction alleging anti-trust and registration violations. In addition, the Internal Revenue Service served Ogle with a federal tax lien for over $20,000 after an audit. Ogle was virtually paralyzed in the further development and marketing of his device. Ogle had been gravitating toward gambling at the pool table, and began losing a lot of money in his gambling forays. He indicated to his attorney, Bobby Perel, that he believed people were drugging his drinks. Perel was skeptical, but on August 19, 1981, Ogle collapsed and died from what an autopsy showed was an overdose of Darvon and alcohol. The death was ruled to be a suicide after a cursory investigation, but several people close to Ogle indicated that they did not believe that Ogle would or could kill himself. With the pollution, make horses power ! The vacuum invite you for this, and the system exist since 15 years. Why do they insist to hide it ? The pollution from gasoline engines is kept in the whole world for reason of taxes collected by the governments and larger sales on petrol from the oil companies. Since 1974 when Renault (French car manufacturer) tested my system, they hide the results. There concept is to make a blackout then to cheat, uninform, lye, without any hesitations. On last January 23, we elaborated a program of research for a clean and low consumption engine. A delay of 5 to 8 years is expected to success, and for now, they speak only about improving the catalysis system. It would be only a prolongation of 5 to 8 yaers of the present state. But all the persons in charge of this program now that the clean engine that they are looking for, exist already. May be they know also that the catalysis process is only a lye through which we use 22,4% more fuel, and also that we increase the CO2 production by 13%. We asked M. Rene HERAIL to tell us more. – Q How is it possible that your system that is already used and for sale in a workshop, is not more famous? A – I’ll tell you why. But first, if you agree, it has never been clearly told to all those who are using gasoline cars to pollute, means to transform the fuel in pollutants, loose energy by wasting it, destroying the engine by feeding it with a fuel that it can only partly convert under heat. It is curious also that in all the media we hear so many lies like: ‘Lead protect the valves and pistons’ or also ‘You can’t use a Lead-free fuel in this or that engine’. What is even more strange is that the system to eradicate the pollutants exist since 15 years and that it is hidden. It has been hidden because the Golden Vault is still stand up. All of us are paying enormous amounts, soon the taxes will be 4 times the cost of the fuel itself. But the worth is that the use of this fuel disturbs a lot the life of everybody. It’s Renault that tested my system in 1974: pollutants below those exigible in 1992. To increase our consumption by 20% they offer us the catalysis converters, and we still crack the wasted fuel, through heat from the exhaust and many unpleasant products, whithout solving the problem out of the paper. – Q Sould we give a description of pollution? A – It’s all the gases exhausted from the engines and the fuel burners. It’s due to the incapacity of carburetors and injectors to transform completly the fuels into gases. – Q What is the result of this incapacity? A – Like it’s possible to burn (combining Oxygen with a combustible) any fuel that is not completly vaporized, all the part of fuel that still liquid can’t burn (and then dosen’t give power). It doesn’t give power and also it’s converted to pollutants, what create a lot of important problems. – Q What are the pollutants in gasoline engines? A – First is the Carbon Monoxide (CO), the rest of unburned gasoline (HC), end the Nitrogen Oxides (Nox). About the latest, they make an important propaganda to force the use of catalysis/converters, even if they exist only as trace elements in the gasoline engines. – Q You talk about the uncapability of carburetors and injectors to transform the fuel in gas. So why? A – Carburetors and injectors are only pulverisators. What we called ‘carburation’ has only been til now a pulverisation plus or minus fine in the air sucked by the engine. It was running like this. the routine made that we didn’t went to look further. But pulverized is no enough to evaporate. That’s the source of the actual problems. If we look at how the carburetor is working, we see the formation of a cone with an umbrella shape that open itself as we accelerate. It is seen that a quantity of small drops, that start from the cone, go and crash on the walls of the admission section that goes to the cylinders, along wich they flow. Looking closer we could register, if our eye had the necessary sensitivity, that a drop loose very fast a part of its weight, when the lighter constituants evaporate, starting to saturate the air sucked by the engine, but what stay from this drop of fuel come and crash on the wall of the carburetor and flow along the admission pipe. Immediatly after it starts to flow, the drop can’t evaporate anymore. Firstly because it is in a already partially saturated air. Everybody knows that the evaporation is then very much slower, and in fact the drop arrived as liquid in the cylinder. – Q The reasons of this phenomenom? A – Gasoline is a mix of hydrocarbons with very different evaporation speeds, and different octane values, that indicate their ability to auto-ignition, also very different. They are: the parafin Octan 0, the oleins Octan 0, the naphten Octan 34, the iso-parafins Octan 100, and the aromatics Octan 130. The first 3 are very light, very fast to evaporate and become a carburated gas that carry to the cylinders the iso-parafin and aromatics that flow along the walls or stay as small drops in the air. That’s the desaster because we filled the cylinders with a mix like the one that create explosion in the coal mining. This gas looks like Methane, as soon as it is compressed, it ignites. The small drops inside this gas looks like the coal dust in the mines. Since the used of the gasoline from oil, we abtain heterogenous mixes that create multiple auto-ignition phenomenom, the ignition take place in an unorganised way. Pistons are mistreated, because each of the small drops is like a small bomb that under explosion create very hard local pressures that apply unregularly on the pistons’ surfaces, creating the ‘ping’ sound that is the hit of the piston body against the cylinder wall. This ‘ping’ effect that we hear at idle rpm but that doesn’t stop at high speed is very destructive. But it’s not all: each samll drop absorb calories to crack, while producing pollutants. Decreasing the engine temperature it decreases its energy. That’s the uncomplete combustion of the gasoline that is the source of all this troubles. Unless the fuel is vaporized in a gas state, this problems won’t be solved. – Q How to resolve that? A – Find the system to vaporized integraly and instantly. I looked for it for a very long time, trying different systems that didn’t gave good results. And then, one day that I was fishing along the Adour river, thinking about my research. I was in a place where were big cement pipe that permit the water to pass through, the water was coming up, a gellyfish came to the entry of a tube, morphed its body, streched it and passed, like sucked. Like a flash my brain told me: ‘Your small drop it’s the gellyfish’. Then I get the idea to use the vacuum. The time between pulverisation and introduction in the cylinders is very short. And we have to create a perfectly homogenous gas mix before to reach the admission valve. I discovered that the vacuum was acting in less than 5 thousandths of a second, what is enough even for the fastest engines. May be that in a so short time the vacuum makes no selection between the rates of evaporation of the different elements. Everything go to the gaseous state, so everything burns. There is no more hot cracking; we obtain free energy from the gasoline already cracked and transformed in pollutants. – Q But you went even further? A – Normally the time of ignition is a compromise because we have multiple uncontroled firing, localised auto-firing when we should be able to control the electric firing for each spakplug at the best moment. Like we do not control auto-firings, we choice the less troubleling moment for ignition. This problem disapeared because of the stability of the mix under pressure; we obtain a better efficiency. Simply said; in place ofmultiple uncontrolled fires, we have an ignition of the mix that start from the sparkplug and propagate with harmony, what has for result that the pressure is everywhere the same. – Q How long it tooks you to complete your system? A – Around 19 years because without any means to meter it, I had to go by test and see. – Q What was your intention at the begining? A – I wanted to stop the waste of fuel. I found that it didn’t burn, so I looked for a solution. Of course at that time the pollution problem was not so important, we even didn’t had instruments to meter it. I had understood that the pollution would be decreased with a perfect combustion. I think I get it; 3/1000 of CO at idle rpm, and almost zero at higher speed prooves it. Doing better seems impossible. – Q What is your wish today? 1/ The clean engine exists officially since the tests by Renault in 1974. 2/ It’s because of my invention of evaporation through the vacuum that is was possible. 3/ I successed in the objectives of the January 23, 1990 program. 4/ The catalysis is useless. And even nocive. It increases the fuel consumption by more than 20%, and the volume of CO2 produced by 13%. It’s a non-sens, a cheating. 5/ My invention suppress the pollutants on all gasoline engines in use now, and open the way to produce new engines with hygher compression rate more powerfull, more economic on fuel, with longer life span, and less pollutant. they will decrease the volume of CO2 by 20%. 6/ They kept the pollution of the Earth just for durty money interests. And now that’s enough. I’m looking for partners to developp my patents in Europe, America and Asia. Prototype has been running for six months as of Nov. 3, 2004, uses 40% less fuel.Technology by Gerald Rowley is proven and ready to gear up for production.Building team for ramp-up.Main application will be with steady speed engines. Patented device by Gerald Rowley replaces standard fuel injection system and carbureted systems for gasoline engines.Working prototype averages 40% less fuel consumption over a conventional fuel delivery system.In discussion with several interested parties to bring to the market. The device is a bolt-on device which can be engineered to fix any size gasoline engine. The existing fuel delivery system can remain in place until the operating temperature of the VAPSTER is achieved which is in the range of 275F to 310F. When the optimum temp. is achieved the original fuel system is shut off and the VAPSTER system takes over.The system is designed for engines which run all day at a fixed RPM. The device introduces the high octane fuel mixture into the air intake of the engine.So it doesn’t matter if an engine has fuel injection or any other fuel system.It uses heat from the exhaust to heat the fuel and the mixture is passed through a throttle body which reduces the air a normal engine would use.The mixture is very lean so only 1/3 to 1/2 the amount of air is needed for combustion.So not only do you save fuel but air/oxygen.I know it is not the complete answer to the energy crisis but it would help enormouslyin reducing our oil import situation. The tested design calls for an engine to run at a constant RPM so it would be best suited for hybrid engines, generators, pumping stations, generating plants, tractors, farm equipment, boat engines, etc.The device has a slowing mechanism built into the patent design by introducing misted water.But, this engineering requires money for further testing. US 6,578,532: Fuel vaporizing and mixing system and method , June 17, 2003.Rowley; Gerald W.
Abstract: A fuel vaporization and mixing system is provided for producing a mixture of fuel vapor, atomized water and air for delivery into an internal combustion engine, the system being configured and positioned relative to the internal combustion engine to draw heat from the engine exhaust system to vaporize fuel for combining into the mixture. I have built over twenty prototypes over a ten year period.…However, I jumped back on the project several years ago pursuing a patent on the best developed prototype.Earlier this year the prototype was built and several weeks of testing to tweak the device provided good results.I have been testing the device for over six months with no mechanical failures.The device is safe as materials are stainless steel.The heating chamber used is over 10 years old which was used in an earlier prototype.The system operates on a very low pressure system 1-2 lbs per sq. inch. My experiments have included putting water in the fuel mixture, injecting steam into the air/fuel mixture, and injecting water into the air/fuel mixture. If the water is mixed thoroughly with the fuel the engine continues to run. If the fuel and water separates before being cracked there is hesitation. I use water in the air/fuel stream to control the rpm’s of the engine.When the engine runs on vapors it loves to run wide open.When water is injected into the air/vaporized fuel stream it lowers the rpm’s.However, when steam is injected into the air/vaporized fuel stream the rpm’s remain constant. The device is actually a cracking device and any liquid fuel can be used that doesn’t leave a heavy tar residue.The device is not designed to accept gases (No Hydrogen) only liquids. The device is being tested with gasoline.Diesel may present a problem due to the residue that might build up in the heating chamber and the air/fuel mixture requirements of a diesel engine. I am a racer’s mechanic with over 15 years experience in and off race track.My experience runs the gamut from 5 hp engines to over 300 hp engines. I have rebuilt many engines from the block up, some after every race. My interest came from go-karts from an early age.I raced every day making the engines more and more powerful.I learned the intricacies of fuel types, air/fuel mixtures, compressions, ram air, jetting, bore/stroke, timing, balancing, etc.What intrigued me the most was the fuel types, timing, and the air/fuel mixtures.My goal was top performance from any engine I was working on.The goal was a power range through high rpm’s.This goal was achieved by tinkering with the intake of the engine.What goes in comes out!I experimented with high octane fuels and balanced air/fuel mixtures based on existing air temperature and humidity.So I went to the next step using vaporized gasoline for higher engine performance. VAPSTER is actually a device that completes a chemical reaction.Gasoline is vaporized and is now a higher lean fluid.For an engine to run on a high lean fluid the air mixture has to be lean also.So, VAPSTER leans the air mixture by closing the intake 1/2 to 2/3 over the conventional intake.In the device the fuel/air mixture is constant thus producing the maximum burn at a constant rpm. Page compiled from email correspondence from inventor, Gerald W. Rowley. Still in validation stage. Main application will be with steady speed engines. I would like to introduce to you a system and means to convert liquid petroleum fuels into a steady stream of high density dry vapour.The concept that I have employed allows for the continual production of dry vapor fuel that is capable of running an internal combustion engine.It also recycles the un-evaporated waste liquid fuels with an overflow return line that is connected to a fuel pump.Fine droplets of fuel that would have other wise been aspirated through the engine and burnt in a catalytic converter is recycled, cooled, and returned to the fuel tank.One feature of this vaporizer system is that it removes the liquid fuel droplets and mixes dry vapour fuel into the jet stream, which makes it possible for our automobiles to run as clean as a natural gas powered engines. … During the two summers of 1980 and 1981, I had a strong fascination to improve the fuel economy of my vehicles because they had poor fuel mileage, and produced dirty exhaust gas. So I went to work intrigued with ideas and fabricated many components with all the materials, experimenting, testing, and refining the concept into my present vaporizer design.I incorporated a totally enclosed efficient heat exchanger unit that gets it heated medium pumped and circulated from the engine, the heat is then transferred to the inner chamber where vaporization takes place. This vaporizer is a system that redirects a portion of the engine heat into the vaporizer unit.It then uses the heat from an internal combustion engine to vaporize liquid gasoline into high-density dry vapor.When the vapour fuel reaches an optimum density, the engine will burn this efficiently as if it would burn natural gas, or propane.This opens the possibility for the dry vapour fuel to be metered, and controlled, and introduced into the engine by similar means as natural gas, or propane powered vehicles. … I must express the importance of safety with the vaporizers that I have invented.The author has spared no expense in using the highest quality certified materials, and all other components, to insure the highest standards for safety and durability are applied. The author has no control of workmanship of others attempting to construct my vaporizers.Therefore, the responsibility of quality and workmanship, and hazards, is on the builder.If you build your own vaporizers different than what I describe in this writings, your results may vary accordingly.Anyone attempting to build any vapour systems such as I described in this writing, must do so with care and caution, and insure safety is front and foremost at all points of construction. Back in 1980-81, the materials that I used to construct my earlier generation experimental test vaporizers were, brass fittings, copper tubing, heater hose, various sizes of tin cans, aluminum, electric fuel pumps, wool, etc.I also constructed ventures using air pumps to push the vapor into the engine where it mixed with the in rushing air as it was running.After I constructed the copper coil tube pipes, and fabricated all the brass and tin components, I used pipe solder and welded it all together, and my first test vaporizers were realized.As proof of concept devices, I installed the system on a 1975 4X4 Blazer Chevrolet with a 402 cid engine, this is the vehicle I owned and used at the time. Being that my vaporizers were inexpensive to fabricate ….I focused mainly on improving my ideas to enhance the vaporization of liquid fuels, and the means to control the flow, and the density, and the mixtures of the air to vapour fuel ratios. Stainless steel is now the choice material for the construction of all my vaporizers described in this report, this insures the safe operation of the vaporizers in a total enclosed self contained unit.All my vaporizers are constructed with 100% non-corrosive stainless steel 2000psi 1/8 thick pipe grade materials, and high quality stainless steel tubing.They are professionally tig welded together, and have no moving parts and it will never wear out. The vehicles that I used for the testing of the vaporizers is a GMC crewcab 1 ton truck 4×4 dually with a 454 cid engine, and the other test car is a 1973 FORD Station wagon with a 400 cid engine. In this vaporizer system that I have designed, there is a small air filter that has a hose connection to an air inlet pipe leading into the gas tank, there is also a one way check valve mounted in between the small air filter and the gas tank, this insures that there is no outward flow of gasoline.This air filter is for the purpose of filtering the in rushing air into the inlet of this fuel vapour system.There is mounted another stainless steel vapour line that is connected to the fuel tank, and runs all the way along the under frame of the vehicle, and goes up to the engine compartment where it enters the bottom of the vaporizer. At this point, the vapour is collected and delivered the from the gasoline tank and plumbed into the filtered air inlet on the bottom of the vaporizer.Test has shown that the density of the vapour fuel from the gasoline tank alone, is enough to run a big block 454 cid engine at up to 1500 rpm.The density of this incoming vapouur charged is greatly multiplied when the incoming vapour charge bubbles through the pool of liquid gas that maintained inside the bottom of the vaporizer.Check (Filtered Air Inlet) in the diagram I provided. There are two fuel pumps in the circuit, a primary and a secondary, as shown in fig 5.The primary fuel pump delivers the fuel into and through cold start injection nozzle that is mounted on the bottom outside of the vaporizer, this is where it makes a fine mist spray pattern that is directed up inside the heated interior of the vaporizer. The secondary fuel pump removes and recycles the un-evaporated over flow gasoline, and cools while it is being pumped back into the gas tank.A pool of gas about 1 1/2 inches deep is maintained inside the bottom of the vaporizer, this is the location where the vapor density that has been delivered from the gas tank is multiplied. Heated exhaust from theengine, and or hot engine coolant is tapped, and circulated into theinletandoutletof the isolated heating chambers of thevaporizer. Heated medium from the engine(such as hot coolant or hot exhaust) is circulated through the isolated flowchambers, and the outer chamber has no flow connection into the isolated fuelvapor chamber. 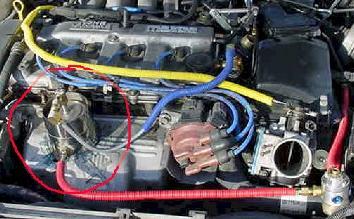 The outlet of the hotexhaust gas or hot coolant is plumbed back to the engineagain. I constructed this vaporizersystem to work as a heat exchanger that redirects and delivers heat from theengine to the vaporizer, and back to the engine again. The heat is thentransferred to heat the liquid fuel that is pumped through the cold startinjector nozzle, the heated liquid fuel is then inside the isolated fuel vapourchamber. The heated dry vapour fuel isthen continually drawn up and through a multi layered screen stack, and out ofthe top of the vaporizer with the use of the engine manifold vacuumpressure. The screen process filters theliquid gasoline droplets that are floating around inside of the vapour chamber,and collects it at the bottom of the vaporizer as the dry vapour fuel isdelivered to the engine. Now we have an isolatedinner vapour chamber that is heated from the engine. The gasoline that is sprayed out of theinjector nozzle is mixed with the vapour fuel that has been pumped from the gastank. The fuel is then vaporizedinto a very heavy vapour density inside the upper portions of thevaporizer. The heavy vapour fuel densityunder manifold vacuum is drawn up through multi layers of 100 mesh stainlesssteel screens, and wool. This multilayered screen system effectively removes all fine liquid droplets that arefloating around inside the vapour chamber, it also functions as an effectivesafety flame arrestor as shown in upper right offig1. A ventury plate (to createthe vacuum) is mounted on and with the air intake system, this is where the dryheavy vapour fuel density is drawn in (or pushed) and metered, and is mixed withthe in rushing air, shown infig 6, 7. The engine then burns this high densityvapour fuel as if it were propane or natural gas. Many components from propane powered vehiclescan be adapted and used in many areas of my vapour system. Such as all the gas lines, vapour lines, hoseconnections, ventury, O2 sensors and controllers to automatically control thevapour fuel to air ratios. This vapour system will runlean if the inlet valves are closed too much, and it will also run very richmixtures if the inlet valves are open too much. The purpose of the O2 sensor and controller chip is to control the air tovapour fuel mixtures. The O2 controllerunit that works with a fast reacting dry vapour valve, cuts back some of thevapour fuel so it will not run to rich. And when the O2 censor controller unit senses a lean mixture, it opensthe fast acting vapor inlet valve to allow more vapour to flow in the mixture,thus keeping the air fuel ratios as optimum as possible. Here is a list of materials that are needed to construct one of my vaporizer systems, some components mayvary depending on what changes you make. 1) Small air filter, one with a 1″inside diameter and approx. 3″ high. 2) 1/8″ 304 stainless steel plate,20″by 20″ square, non-corrosive. 3) One each, 100 and 200-mesh stainless steel screen 20″ by 20″ square, non-corrosive type. 4) Two 7-psi minimum electric fuelpumps for the injector nozzle. 5) 12″long stainless steel pipe, 4.5″ outside diameter, 2000-psi pipe, 1/8″ wall thickness. 6) 4″ long, 2 3/8″ diameter stainless steel pipe, 1/8″ wall thickness. 7) 12″ long stainless steel pipe, 3.5″ outside diameter, 2000-psi pipe, 1/8 ” wall thickness. 8) 10″ by 10″, 1/4″ thick, stainlesssteel plate. 9) 10″ by 10″ square, 1/2″ thick stainless steel plate. 10) 6″ long, 1 5/8″ diameter stainless pipe, wall thickness 1/8″ or less. 11) Electronic feed back control dryvapor valve with O2 sensor, (# note this is optional). 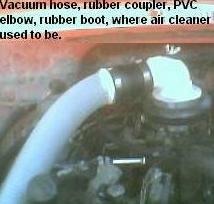 12) Propane vapor hose or stainless steel line, 1″ diameter, enough to reach from gas tank to engine compartment. 13) 12 volt, 3 terminal solenoid, andtwo 15 amp toggle switches. 14) Spools of electric wire #14 gauge,black, red, green, yellow. 15) Silicone pipe sealant, or tape pipesealant, to prevent leaks in the threaded connections. 16) Machine fasteners, 1/4″ thread, 1/2″thread length, box of 30. 17) 1/2″ long machine fasteners, 1/8″ thread or a little larger, longer fastener can be cut. 18) Volkswagen Rabbit Cold start injector nozzle, or similar stainless steel type. 19) Several sizes (threaded inside) stainless fittings for plumbing of inner chambers. 20) 1/2″ diameter stainless tubing (#note -not pipe) for hot coolant version, 30″ long. 21) 3/4″ diameter stainless tubing (#note – not pipe) for hot exhaust version, 30″ long. 22) Several sizes outside threaded brass fittings for plumbing of lines. 23) 25″ long stainless tubing (# note -not pipe), approx. 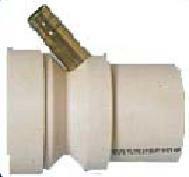 minimum 3/4″ inside diameter. 24) 25″ long stainless tubing (# note -not pipe), 1 1/2″ diameter. 28) 10′ heater hose, if hot rad coolant option us used. 29) Several sizes of stainless steelclamps, 16 total (no weaker steel ones). 30) Several flat rolled iron bars, 3/4″wide & 1/8″ thick, for mounting of vaporizer, etc. 31) Nuts & bolts, 1/4″ thread, several sizes less than 1″ long with washers & lockwashers. 33) Ventury carburetor with valve & linkage not purchased until engine type is known. 34) 2 lbs of sand for pipe bending, this prevents collapsing of the coil tube. 35) Some materials will be left over whenthe vaporizer is fully constructed. Many pictures of the different parts are on his website. This author is aware that gasoline is composed of approximately 27 difference chemicals and they allvaporize at different temperatures. The vapour system I describe in this writing will tend to circulate the heavierun-evaporated fuels back into the gas tank. If the temperature of the vaporizer were increased to around 450 degrees to vaporize the heavier liquid fuels, less un-evaporated overflow gasoline would circulate back to the fuel tank. This vaporizer is capable of operating at these higher temperatures with modifications to the exhaust system. This arrangement could lead to the elimination of the fuel return line, by pumping only the amount of fuel that the vaporizer needs to produce the desired amount of dry vapour density, on engine demand. System uses 200-degree engine coolant to vaporize the lighter chemicals out of gasoline into an isolated chamber system.Inventor is working on a way to crack the heavier part of the gasoline. Adapted by Sterling D. Allan, Pure Energy Systems News. The truck on which the vaporizer system is installed is a full-size 1986 GMC 4×4 1-ton crewcab truck with a 454 cid engine. It is the older style truck with the very same big block engine that the newer trucks have. “The concept will work with all internal combustion engines, big or small,” Francoeur said. He said he still has plenty more work to do. Developments will include installing sensors, meters and computerized circuits to optimize the control systems, and ironing out any bugs. Though this fuel system is his present focus, Francoeur has other energy technologies that he has been pursuing as well, including an electromagnetic generator system in the tradition of Nikola Tesla. – Cl. F02M 31/00 – International Patent Classification: Gasoline Vapor Devices. # Wallace William, USP # 5,606,956 – Elongated fuel-air bypass for internal combustion engine. Abstract – An elongated fuel-air bypass is connected between an outlet port of a fuel-air mixing device and an inlet port of an intake manifold of an internal combustion engine. The elongated bypass apparatus includes an elongated bypass conduit formed of a thermally conductive material and which has sufficient length, exterior surface area and thermal conductivity to enable it to cause liquid fuel introduced through the fuel-air mixing device to change from a liquid state to a gaseous state prior entry into the one or more cylinders of the internal combustion engine. Turbulence creating mechanisms, such as venturis or baffles, are provided in the elongated bypass conduit for creating turbulence in the fuel-air mixture flowing therethrough. An after-air supply tube is provided to supply after-air near an upstream end of the fuel-air bypass conduit, and is controlled by an after-air valve to provide for a lean fuel-air mixture. Also provided is a liquid additive system for supplying water and/or alcohol into the fuel-air bypass conduit. A start-up fuel injection system is provided to inject a burst of fuel into the fuel-air bypass conduit at initial start-up of the internal combustion engine. At least one reparticulation reservoir is provided in the bottom of a portion of the fuel-air bypass conduit in order to enable quick start-up of the engine after flooding. Abstract – The ram tube of this invention basically consists of an intake bracket, inner tube, output bracket, outer tube, input port and output port. The intake and output brackets are attached to the ends of the inner tube for attaching the ram tube to the base of a carburetor and the intake to an intake manifold of an internal combustion engine. The outer tube is installed over and surrounds the inner tube to create a passage between the inner and outer tubes. Exhaust is directed from the exhaust manifold of the engine to an input port on the outer tube. The exhaust passes through the passage and exits through the output port. 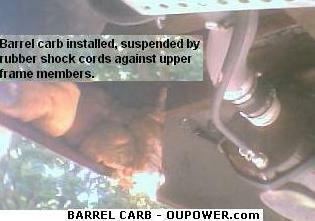 The exhaust heats the inner tube to in turn heat the air/fuel mixture passing through the inner tube. The fuel is completely vaporized and placed in a dry vapor condition as it passes through the heated inner tube. The fuel entering the combustion chamber in a dry vapor condition burns more completely, at a higher temperature and at a faster rate to provide a higher efficiency engine. Due to the high temperature achieved using the ram tube, water can be injected into the ram tube or air stream for use as a fuel supplement. The ram tube of this invention can also be used in conjunction with a heat exchanger for initial vaporization of fuel in cooler weather and/or a turbo charger, or other type of device which increases volume efficiency, for pressurizing the air/fuel mixture for additional engine performance. Abstract – Carburetors and fuel injection systems are used to facilitate a combustile mixture of air and fuel for internal combustion engines. Inherently, the fuel in this mixture is mostly in liquid droplets. However, it is the vaporous fuel which combines with the air gives an explosive mixture; and it is this mixture that can be exploded during the short engine power stroke time available. The rest of the fuel in liquid form simply burns or exhausts to the environment, hence impairing the efficiency of the engine and polluting the environment. In this invention, liquid fuel is vaporized and combined with air to form an explosive mixture before introduction into the engine. In this design, ultrasonic technology is employed to atomize the fuel in the form of fine fuel mist. This mist is then injected into a specially designed heat exchanger, in which hot engine exhaust gas is brought in to cause this subspension of fuel mist to vaporize. Subsequently, this vaporized fuel combines with the intake air to form an explosive mixture. In this process, microcomputer technology is employed to control the precise air to fuel ratio of the mixture according to the degree of fuel vaporization and the demand of the engine operation. The fuel in this mixture is in a vaporous state; therefore utilization of the fuel is maximized. Abstract – The present invention proposes a fuel-air mixture-forming device for internal combustion engines, having a rotationally symmetric nozzle body (2) which, together with a rotationally symmetric throttle body (8) displaceable in it, forms a convergent-divergent nozzle which discharges into a radial diffusor (6). In the vicinity of the narrowest cross section (5) of the nozzle there is provided a fuel slot (11) extending around it and discharging into it, at least one fuel feed line (9, 10) discharging into the fuel slot. The radial diffusor is formed by a region of the nozzle body which is curved outward in the direction of flow of the mixture and by a wall (15) of a structural member (17) which forms a structural unit (18) with an intake manifold (7) of the internal combustion engine, the wall (15) lying opposite the nozzle body and being rotationally symmetric to the longitudinal axis (1) of the throttle member and having a bulge (16) pointing toward the throttle member. Due to its development, the radial diffusor makes it possible that a film of fuel which necessarily adheres to the diffusor wall upon injection of the fuel detaches itself, whereby an improved mixture is formed. Abstract – The present invention is related to a diesel engine fuel pipeline heating device and particularly to a diesel engine fuel pipeline heating device consisting of an electric heating device and a water (or air) temperature heating device provided to the exterior of diesel engine fuel pipe. A diesel engine equipped with such a heating device can be easily started through the electric heating device to heat the fuel in the fuel pipe up to a suitable starting temperature around 40.degree. C. (or 104.degree. F.) before starting the engine; and after starting the engine for some time, namely, when the temperature in the heating cylinder of water (or air) heating device has risen to the said suitable combustion temperature around 40.degree. C. (or 104.degree. F.), the power source of electric heating device is automatically turned off to stop the heating action. Then the hot water from the water return pipe of radiator or the hot air from the exhaust pipeline of exhaust pipe keeps continued preheating of fuel pipe for a constant temperature through the water (or air) heating device so as to continuously keep the full fuel combustion, easily and smoothyl start and run the engine, save fuel and enhance the horse power of engine. Abstract – The invention relates to a method and system for increasing the output in terms of miles per gallon attainable by a conventional internal combustion engine. The improvement in m.p.g. is the result of a fuel vaporizer unit which utilizes engine coolant and exhaust gases in heat exchange relationship to vaporize raw fuel. The gas vapors are collected within the vaporizer unit and then directed to the carburetor wherein it is united with air prior to entering the intake manifold. It has been found that running an engine on a mixture of gas vapors and air produces significantly improved mileage over that otherwise attainable. An additional advantage of the vaporizer unit is the resulting reduction of the amount of pollutants released into the atmosphere due to the complete and total combustion of all the vapors entering the combustion chambers. Abstract – A vortex fuel air mixer is positioned between the air throttle and the intake manifold of an engine. Part of the expansion flow velocity past the air throttle flows tangentially into the vortex chamber of the mixer, providing angular momentum which drives the flow into a vortical pattern. The flow streamlines within the vortical flow form into a generally irrotational flow pattern which swirls from the outside wall of the vortex chamber inwardly to a central vortex chamber outlet. This outlet feeds the engine intake manifold. Centrifugal forces in the swirling flow fling fuel droplets to the outside wall of the vortex chamber (in the manner of a cyclone scrubber). This liquid fuel must evaporate in order to leave the vortex chamber. The interaction of the evaporation, flow structure and turbulence relations inside the vortex chamber produces an essentially homogeneous mixture at the vortex chamber outlet. Fuel evaporation time in the vortex chamber is quite short, so that the device exhibits excellent transient response. Abstract – A device for completely vaporizing the fuel delivered to an internal combustion engine so as to minimize the emission of air pollutants. The device includes a heat conducting tubular housing, a heat conducting screen within and coaxial with the housing with an annular space between the housing and the screen, a heat conducting helical coil within the annular space and coaxial with the housing and the screen, and means for heating the helical coil, either electrically, or with heated air. In one form, a diffuser within and coaxial with the screen adjacent the inlet of the housing directs a fuel and air mixture outwardly into contact with the screen, helical coil and housing. In another form, a fuel injecting means within and coaxial with the screen adjacent the inlet end of the housing sprays fuel toward the outlet end of the housing and outwardly against the screen. A de-icer tube communicates with the inlet end of the housing for delivering heated air thereto under icing conditions. Abstract – An approximately 1 inch thick plate, 4 or 5 inches square, having a plurality of 1/16 inch perforations drilled through the 1 inch thickness and extending over approximately half of the central square area of the plate, and with exhaust gas passages surrounding the drilled hole area, is inserted in the flow path of the fuel and air mixture from the carburetor to the intake manifold of an engine. An exhaust gas supply line leads from the exhaust manifold of an engine, to the plate, and from the plate downstream to a further exhaust gas outlet in the form of a coupling with the PCV line which communicates with the carburetor in a conventional manner. In operation, this vaporizes the fuel as it passes through the plate. VST is proud to present an astounding collection of 920 fuel vapor system patents designed to increase gas mileage and performance of an automobile. Over 400 hours of research at the US Patent Office website has produced this absolutely mind-boggling collection of secret and suppressed patents. Nearly 700 of these patents are expired, and can be built and sold by anyone! Before building our own fuel vapor system, we wanted to know what had done before us. After logging onto the US Patent Office website, we figured out where these systems were hidden and buried under the various categories and subclasses. During that time, we downloaded over 11,000 individual TIFF files, ran them through a PDF file converter, and ended up with 920 different patents, each as it’s own PDF file. Categorized in a directory broken down by decade, then by type of vaporizing system, these pages are easily navigated to locate any type of system you could imagine. There are over a dozen different categories of vaporizers, and we’ve got them all! Starting in the 1970’s, the US Patent Office also created an Internet (HTML) page for each patent. These have also been included in our info. They even have all the functional links to other inventions that are either referenced by or to the current one you are viewing. Note: those links will take you directly to the Patent Office website! Because these HTML files can be text-searched, we also included a search engine on our CD and in our website data. It’s a snap to find anything you might be interested in with the click of a button. No need to spend countless hours searching for hard to locate specific details! On our CD version, we even offer a 10-day unconditional money-back guarantee if you’re not completely satisfied (cost of CD), an unheard-of offer for ANY software! The following are examples of what you’ll find on our CD or surfing our site. These are all systems that drastically improved gas mileage. By the way, they were found very quickly by using the built-in search engine on our CD. And there are HUNDREDS more where these came from! There are nearly a dozen different methods used to change liquid gasoline into a vapor. This will give a quick overview of the most popular ones, along with some of the pros and cons of each approach. Note: Many of these methods can be used in conjunction with each other. – Electric heating elements. The benefit of this method is that you can regulate the amount of heat being applied to the fuel almost instantly from inside the car. The drawbacks are that you can burn up heating elements, and if you were to short-circuit one that has fuel going past it, there is the potential for a loud noise, a lot of heat, and of course, flames. That could be BAD 🙁 Also, it takes between 20 and 40 amps to keep these elements hot enough to be effective. That puts an incredible strain on your car’s charging system over the course of time. – Coolant heating. Benefit – Free heat! Drawbacks – quite a few. First, a modern cooling system reaches a max temperature somewhere around 220°F. This will vaporize the lighter hydrocarbon ends, but will not begin to touch those heavy hydrocarbons blended into the fuel to give the engine a nice, smooth burn in the cylinders. Too many light molecules can lead to detonation and engine damage, too many heavy ones can cause hard cold starts among other things. Also, it takes at least several minutes to get up to operating temperature, and unfortunately that is exactly the time when a vapor system is needed most. Cold starts are when engine wear occurs most, because liquid fuel acts as a scouring agent, washing down cylinder walls and eventually creating blowby. One last issue is that heat taken from the engine and put into the fuel can prevent the engine from reaching it’s intended operating temperature, thereby keeping a modern engine management computer from switching to ‘closed loop’ mode. This simply keeps the car running in a less efficient backup mode, which in itself can eventually cause engine wear and emissions component failures. – Exhaust heating. Easily the favorite choice of many inventors. A lot of benefits. It’s free energy that would otherwise be wasted right out the tailpipe. You can have over 500°F within 15 seconds after a sub-zero cold start, and can reach over 1000°F within a minute. These temperatures can easily ‘crack’ the fuel down to it’s basic molecules. Many systems using this method have had incredible success at increasing mileage. See 10 Vaporizer Examples . The disadvantage of systems using exhaust heat is that it’s difficult to regulate the exact temperature of your vaporizer. Fuel can actually reach what is called ‘auto-ignition’ temperature, where it combusts on it’s own without a spark. That occurs somewhere just below 500°F at atmospheric pressure. However, if the fuel is heated while it’s under vacuum, the auto-ignition temperature goes way up. Now if the fuel auto-ignites and doesn’t have any oxygen to sustain combustion, it simply reverts back to a liquid, thereby defeating the purpose. One last problem I’ve experienced is that at 1000°F+, metal warps. It’s very difficult to keep machined surfaces true when the metal is expanding and contracting every time it heats up and cools off. Ceramically coating parts can go a long way in preventing this. I definitely recommend it if you should choose this method. – 2 – Combining fuel with steam to cause vaporization: Superheated water is an excellent way to crack fuel molecules. It happens pretty quickly, and the steam also cleans the intake system. I’ve read about some systems that actually start to get hydrogen and oxygen to release from the water, thereby enhancing combustion in the cylinder. Drawbacks are that when the engine cools back down, steam turns back into liquid water. It can cause rusting, and worse than that, it can hydro-lock an engine if the cylinder gets too much water in it. Getting the right mix of steam and fuel is also tricky. You don’t want too much water, or else the fuel becomes too diluted and unburnable. – 3 – Sonic Atomizers : Systems that use sonic waves are not true vaporizers, in that they don’t change the liquid into a vapor. However, what does happen is that a small sonic boom is created at the point of fuel introduction into the intake, and as a result, the liquid fuel droplets are obliterated into a fraction of their usual size. Because of this, the surface area of these droplets increases drastically, and the heat in the intake and cylinder is then much more able to vaporize them. Very effective. I have firsthand reports of just such a system that achieved 100 miles per gallon on a 4-cylinder engine during the ’70s. The only drawback I can find is that in order to create the sonic boom, you have to have airspeed traveling faster than sound. The intake manifold is very likely not able to achieve or maintain that. Consequently, an air pump or compressor may be needed to pump air through a sonic nozzle fast enough to reach that velocity. Typically, 20-30 psi must be maintained through the nozzle to generate the effect. Using a compressor will draw about 20-30 amps continuously, thus putting a major strain on the charging system. An engine mounted pump would seem to be a better choice, although I know of no such pumps that can generate that kind of pressure. – 4 – Reformed Fuel Vapor Systems: Reformed fuel is just another way of saying that super-hot exhaust gases are injected directly into the fuel to heat and vaporize it. I remember reading a little booklet 25 years ago called ‘The Secrets Of The 200 Mile Per Gallon Carburetor’. I don’t remember much about the booklet, except for one very important sentence that I read. It said: “The fastest way to vaporize fuel is to inject hot exhaust gas directly into it.” That one idea stuck with me, and I was able to devise a simple exhaust injection device that ultimately yielded a 35% increase in gas mileage! It had certain issues that made it unmarketable, but the concept was definitely settled in my mind that vaporizing fuel would yield substantial increases in mileage. The main drawback with the system I had built (it cost $3 at the time, incidentally), was that I didn’t have an effective way to shut off the exhaust at idle. It affected the idle quality noticeably, much like an EGR valve today being stuck open. The solution to this today would be to simply use the EGR valve as the control for the system, only route the exhaust gases to the fuel before sending it into the intake manifold. – 5 – Catalyzers : These systems use exotic metals to chemically convert the fuel, much like a catalytic converter changes exhaust into harmless gases. As a matter of fact, the metals used are much the same: platinum (you’ve heard of platinum spark plugs), palladium, rhodium, and a few other exotics. One more method is to use stainless steel with a high nickel content, as it has been found that nickel also catalyzes fuel. I would recommend using this type of stainless steel in the construction of any vapor system. I believe the 300 series metals should do the trick. The down side is that they are not cheap, and getting the right alloy mix could be a very expensive experiment. Also, I haven’t heard of many catalyzers that yield drastic increases in mileage, although I have seen one system that would consistently double miles per gallon. I was not told what metals specifically were being used, and it was all very hush-hush. I hope this information is useful to you, and gets your creative juices flowing, so that you too can build a successful vapor system to reduce your dependence on foreign oil. I’d love to hear back from you if you have any questions or comments. Drop me a line if you like at [email protected]. Thanks for your interest and your time. We appreciate all those people that are looking for and creating answers to today’s energy problems. There isn’t a lot you can do to improve the fuel system on a car. They are built the way they are and it is hard to change them. However there are some ways to condition your gasoline where you can extract more energy from it. It is said that the average car only extracts about 25 to 30% of the energy out of the gasoline that goes into it. That means that from 70 to 75% of your gasoline is either being used within the engine or is going on through the engine unburned. Any method you can use to break the gasoline down to a smaller particle size before it enters the combustion chamber will increase the MPG and the performance. So will any additives you can add to the gasoline to make it burn more complete. The auto makers could easily re-design the engines and their fuel systems and increase the mileage 100% or more. There is only one problem with this and the only reason it hasn’t happened . The oil companies are not going to sit by and allow the demand for gasoline drop by 50%. If it does then their profits on gasoline would also drop 50%. They will never allow that. On the other side of that coin our Federal Government collects huge amounts of money on gasoline taxes. They would never allow that to be cut by 50%. The only chance we will ever have to enjoy an increased MPG is to make the modifications our selves or switch to a different form of energy that we can produce our selves. We have dependedon the big oil companies for our motor fuels just about as long as we can afford to.If so many people were not making large amounts off the gasoline powered combustion engine they would have been replaced long ago. The LPG in the liquid state reaches the regulator-vaporiser ( 1 ) through the LPG solenoid valve ( 2 ), which is only open when the vehicle is running on gas. The LPG is vaporised inside the regulator and its pressure is reduced. From the regulator – vaporizer the LPG in the gaseous state is in-taken by the engine through the mixer ( 3 ), which is specific for each individual vehicle and fitted upstream from the throttle, allowing the gas to mix perfectly with the air to create an even mix. Considering that the kit is standard, a maximum pressure register ( 4 ) is to be fitted on the connection hose between the regulator-vaporiser and the mixer which, together with the adjustment screw on the regulator, enables the installer to perfectly set and adjust the system. When the vehicle is running on gas the flow of petrol is intercepted by a solenoid valve ( 5 ) fitted between the mechanical fuel supply pump and the carburettor. The choice of the fuel on which the vehicle is to run (LPG or Petrol) is completely up to the driver who can choose the fuel by operating the switch ( 6 ) fitted in a handy position inside the vehicle compartment. This switch can also be equipped with a fuel indicator. The pressure regulator is used in the LPG fuelling system for 4-stroke endothermic engines with controlled ignition and has the function of reducing the pressure and of regulating the amount of LPG to be sent to the engine. It can be used indifferently for carburettor, injection and catalyst injection engines. It may have 2 or 3 pressure stages but in both cases the last stage is the type with vacuum output. The pressure regulators – vaporizers for LPG are complete with a safety valve fitted on the first stage and a heating chamber in which the engines coolant circulates. This valve is electro-magnetically controlled and is installed in the connection piping between the LPG cylinder and the pressure regulator – vaporizer. Its task is that of intercepting the flow of LPG when the engine runs on petrol and when the engine is turned off. The inlet of the solenoid valve is equipped with a filter where the LPG leaves any impurities behind. This valve is electro-magnetically controlled and is installed in the connection piping between the Fuel Supply AC pump and the carburettor. Its function is that of intercepting the flow of petrol when the engine runs on gaseous fuel (LPG or CNG) and when the engine is turned off. The solenoid valve is equipped with a manual emergency tap. It is not required in conversions of injection vehicles. The TEC Evolution is an anti-pollution system used to control, in a closed-loop system, the emissions of catalyst vehicles complete with Lambda probe and converted to run on LPG or CNG. The TEC Evolution anti-pollution system maintains the stoichiometric ratio of the fuel setting constant through the acquisition of the Lambda probe signal. By processing the engine RPM and position of the potentiometer of the accelerator pedal the TEC Evolution anti-pollution system optimises the driving parameters during the transitory phases in acceleration and in deceleration. The electronic CPU can be installed both in the engine bay and the vehicle compartment indifferently, whereas the switch unit, considering its very small size, is normally installed on the dashboard in a handy position for the driver. This is a range of mixers which, thanks to their configuration, are used to keep the petrol performances almost unaltered even after the vehicle has been converted, thanks to the special shape which generates an increase in the air velocity. They can be installed on carburettor, injection and catalyst injection vehicles. This is a range of mixers designed to be installed in vehicles having restricted space in the engine bay. The special design ensures that the performance of the converted vehicle is as near as possible to that of the original vehicle. They can be installed in carburettor, injection and catalyst injection vehicles. The function performed by the mixer is to introduce the quantity of gas necessary for the correct operation of the vehicle, ensuring its optimum distribution in the induction airflow. As it is installed between the air filter and the throttled body it can limit the vehicle’s performance, even when running on petrol. The mixers designed by Tartarini Auto SpA reduce air-side load losses to a minimum, which makes their application practically “painless”.